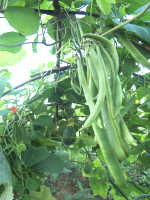 Every organic gardener should try growing runner beans. This full description contains useful tips to try out e.g. space saving walk-through arch runner bean supports; plus complete details on gardening Runner Beans. This link goes straight to a choice of Runner Bean Seeds available in the - U.K.
AND for American Gardens . use slow growing evergreen trees or hedging - Supports that won't compete or need to be trimmed while growing runner beans. However, lets start with soil preparation and planting seed. 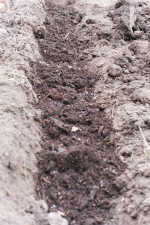 Autumn/Winter: trench filled with garden compost ready for growing runner beans in rows. A firm moisture retentive soil is best for growing runner beans. Dig in plenty of organic matter during autumn or winter. Fill trenches one spit deep with garden compost to plant in rows; add in bucket fulls for maypoles or wigwams. Soaked newspapers (or leaf mold) layed on the bottom help to retain moisture. Shredded Comfrey leaves can boost flowers and fruit. Gently firm down as you add material. Don't add Nitrogen rich fertilizer e.g. no manure... Nitrogen fixing bacterial grow in root nodules of beans. Some gardeners have achieved very good results from soil inoculating - my page on biofeeds will be re-posted later. A very small sprinkling of Fish, Blood and Bone fertilizer around each hole will help to establish plants. Shallow and dry, usually sandy acidic soils, are not normally ideal, neither are poorly drained sites. But trench composting on well-drained sites and over sandy soil can be followed by growing runner beans. Only plant in settled ground. Also, try growing runner beans in large containers with 50:50 loam based to organic based compost - free-drained and regularly watered. Semi-shaded sites are better than full sun. Hot summer days and irregular water content cause fruit set problems and poor development e.g. wilted, waisted or curved pods etc... If you have a seep hose then this could be a convenient place to install it. Bury it several inches. But it won't make up for poor soil water retention. Before planting out double rows thoroughly water and lay a 2 foot wide strip of black polythene mulch to finish. This retains moisture and solves the weed problem. First install supporting structures. Then sow outdoors in holes about 5cm deep. A small handful of worm compost or leaf mold added to planting holes will help. Runner beans won't germinate in cold wet soil - only plant when the risk of frost has past and the soil has warmed. Top sections cut off clear plastic bottles and placed on site a week before planting seed will prevent frost and warm the soil. They may keep mice off too, but a dash of pepper also works. You can thermally protect a larger area with Envirofleece. Alternatively sow indoors in deep fibre pots. This time avoid over-heating. Harden off as soon as possible and plant out when frost has past. Fibre pots break down naturally and allow seedlings to be transferred directly to a plant hole without disturbing roots. Some gardeners recommend planting 2 seeds per hole. But a better insurance is to soak seed on a saucer covered with damp tissue paper and then, as they are about to sprout, plant the swollen seeds with moist compost. Remove all weeds by hand or control with mulch. The large leaves of Courgettes, Marrow, and Gourds are certainly useful in shading the soil around beans. They can be planted some 2-3 feet away as they readily spread over-ground. Sweet Corn is useful to provide climbing support. Summer Savory is reported to be a good companion plant. Encourage bees for pollination and laydybirds for pest control. Stem growth should be stopped at the top of the support. This practise diverts energy from leaf growth into flowers and fruit. The leading shoot can also be nipped out earlier to encourage side shoots; these can in turn be stopped after 2 leaves or so. Ensure continued production by regularly picking all ripe pods. The above is a full account. Many gardeners get by on less. Here are the most important points to remember.